MDC-Alliance organising secretary Amos Chibaya has joined his fellow lawmaker from Chiwundura Livingstone Chiminya in remand prison after he was remanded in custody to next week to allow police to locate two missing State witnesses. Chibaya, who is the MP for Mkoba, yesterday appeared before Provincial Magistrate Ms Charity Maphosa facing one count of incitement to commit a crime. Through his lawyer Mr Reginald Chidawanyika, Chibaya pleaded not guilty to the charge. Ms Maphosa ruled in favour of the State which through the prosecutor Mr Brian Mzemba had applied for postponement of the matter to allow the police to locate two witnesses who allegedly fled after being intimidated by unknown people before they could testify in this matter. “We had arranged to call two State witnesses to testify in this case but the police cannot locate them and they need time to locate them,” said Mr Mzemba. Ms Maphosa, in her ruling, remanded Chibaya in custody to January 29 and advised him to apply to the High Court for bail consideration. “The police need time to locate two witnesses and the State has applied for a postponement of the matter. The application is granted because the situation is still volatile. The accused is remanded in custody to January 29,” said Ms Maphosa. Mr Chidawanyika, who was opposing the postponement of the matter, said his client should be released from custody. “The police said they had the witnesses in custody and now the witnesses have disappeared. It should not be our problem and therefore the need for my client to be released,” he said. Yesterday Chiminya – who is also the MDC-Alliance Midlands provincial youth chairperson and is facing one count of inciting violence – appeared before Regional Magistrate Mrs Phathekile Msipa. He was remanded in custody to January 29 after the prosecutor Mr Talent Tadenyika made an application for postponement of the matter to allow the police to locate the two witnesses. 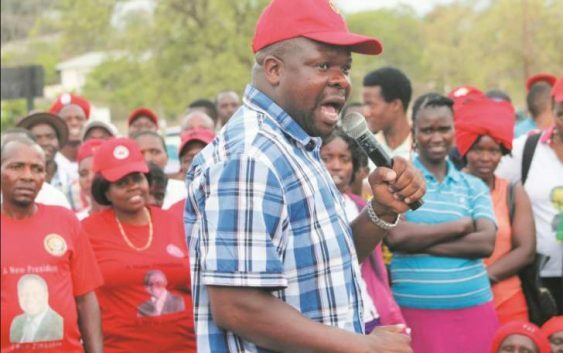 Chibaya and Chiminya, the court heard, allegedly held meetings at their respective houses in Mkoba 13 and 14 respectively on January 13 and incited MDC-Alliance youths to go onto the streets of Gweru to prevent the general public from going to work. It is alleged that youth gangs blocked Hamutyinei and Bristol roads in Mkoba which leads to the city centre; Matobo Road in Mtapa leading to town, using logs, stones and burning tyres, disrupting free movement of vehicular transport and the general public. The 16 other people allegedly participated in disrupting free movement of vehicular transport and the general public. Furthermore, the gang allegedly went to Choppies supermarket in Mkoba 6 and looted groceries worth $10 000, Flame Lilly Bar Mkoba 1 where they looted merchandise worth $1 363 and Samanyanga shop at Mkoba 10 and looted various groceries valued at $2 500. They allegedly looted several shops resulting in shops losing over $41 000 worth of goods. Zupco buses start plying routes between Bulawayo Central Business District and residential suburbs and provide affordable transport to commuters.